A small rounded tree with gracefully cascading branches. 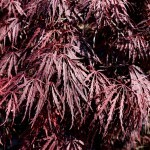 The spring foliage is deep crimson, maturing to purple-red. The foliage is not as finely dissected as Crimson Queen. 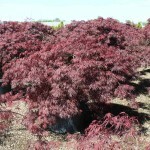 This variety is one of the best for holding the red color through the summer. Fall color is bright red. It prefers a well-drained, acidic soil. It is one of the oldest cultivars, with reference back to 1710.